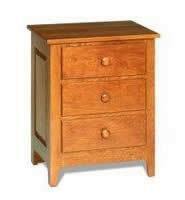 This Night Stand is Amish handcrafted in a authentic Shaker style. You will love the simple but sturdy look of this Shaker Night Stand. The raised panel sides, wooden Shaker hardware and three dovetailed drawers are just some of the quality features of this Amish furniture. It is available in oak or cherry wood as well as a variety of finish options. This nightstand will look perfect with on Shaker Pencil Post Bed or our Shaker Windsor Bed. The three spacious drawers allow for handy nighttime storage. If you have any questions or need assistance order, please call to speak to one of our Amish furniture specialists at 1-866-272-6773. Please allow 8 to 12 weeks for this item to be built.